A new "touch-free" patient monitoring system introduced at an Isle of Man hospital "will not replace doctors and nurses", the health minister has said. The technology, which involves a sensor placed under the mattress of a bed, monitors movement, heart and respiratory rates. 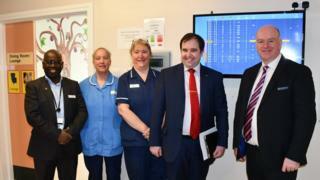 The system has been installed in all 31 beds at Ramsey and District Cottage Hospital as part of a three-year trial. It was funded by charity the League of Friends of Ramsey Cottage Hospital. David Ashford MHK said the "vital system" would ensure any signs of deterioration in a patient's condition "can be picked up early" by medical staff. But Mr Ashford said it would "never replace the human intervention of doctors and nurses". The technology, which cost £268,000, is widely used in America and the Netherlands but has not been used to cover an entire ward elsewhere in the British Isles. Chairman of the League of Friends Leonard Singer said the project would "ensure" the hospital remained "a flagship" of the island's health service. The system monitors vibrations created by patient movement and displays the information on central screens. The sensors can also alert staff when someone who is at risk of a fall tries to get out of bed. Ward manger Valarie Thomson said it did "not change the way patients are nursed", but did give staff "early indications" of any changes in their condition. Ms Thomson said the system had been "taken on board really positively" by patients and their relatives. The hospital treats many elderly patients who no longer need acute care but are not well enough to return home.